Last week I told you about the launch of The Cookbook Project, an attempt to use the resources in front of me to help rediscover my love of cooking four years after Kevin's death. This week I'd like to talk about one cuisine that is many and an old friend of a cookbook, then next week we will venture into a recipe together. It may sound a little slow, but I'm hoping each post will evoke memories and curiosity beyond the mechanics of cooking. This blog is about stories as well as food, after all. I don't remember when I first had Indian food. I know by the time I had graduated college it was a big part of my gustatory life. My friends and I frequented a restaurant called Ghandi in Central Square, Cambridge, Massachusetts (long since closed). We went so often that the proprietors worried when we skipped a week. Each time when we walked in, an aroma spicy complexity would surround us and we took pride in consuming the fieriest food they would provide. Eventually I no longer needed to eat food that hurt me and became interested in the layers of flavor present in good Indian cooking. I began to read about Indian food and discovered it is hugely regional, no surprise for a country so large and with so many different kinds of people, so I began to stretch my tastebuds beyond the usual tandoori chicken and lamb vindaloo, delicious though they were. I eventually learned a little bit about the complex history of some of the dishes and ingredients, realizing in a small way that food is highly politicized, representing not only local ingredients and influences, but those of invaders and trade partners as well. I am by no means an expert in the political history of Indian cuisine, but I began to at least recognize it. It was a significant moment for me, as a white American woman in my mid-20s, learning about the symbolic nature of food as identity, protest, and imperialism. I'm sure some of you have had similar moments, though they may not be linked to food. We began to go to a wider range of restaurants and I eventually bought a cookbook to try my hand at some kind of Indian and other Asian food at home, always marveling at the sheer number of spices and techniques essential for foods I had taken for granted. It was a lot of work. I became more appreciative of the meals I was served in restaurants and I still marvel that Indian food is considered quick and easy in the U.S. My goodness, even a fairly simple recipe has a multitude of spices within. 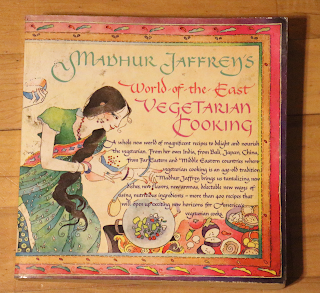 Of all the cookbooks I might have bought, I consider myself lucky for stumbling onto Madhur Jaffrey's World of the East Vegetarian Cooking. It contains recipes from all around Asia covering many different cultures, cooking techniques, and ingredients. Vegetarian or not, you will find many wonderful and delicious recipes therein, all written in such a way that a Western cook has a chance of success. This is comfort food from across Asia. It's certainly not the absolutely most authentic cookbook out there (it was issued in 1987 when ingredients were often harder to find) but it's still good. Jaffrey has helped bring Indian cuisine to home kitchens England and the U.S. and I appreciate both her occasional commentary and the clarity of her recipes. As you can see, my copy is appropriately stained and used. Next week I'll share with you my experiences cooking saag paneer, a spinach and cheese dish I will frequently order when eating out. Stay tuned. And thanks for reading. I'd love to know about your experiences with Indian food, in restaurants, at home, and anywhere else.